The only good thing about most epidemics is that if you act fast you can snuff them out before a local brushfire becomes a global blaze. That's what happened in 2002, when the SARS outbreak was contained after claiming thousands  rather than millions  of lives worldwide. That's what failed to happen in 1918, when a rare avian flu made the jump to humans and killed 50 million people before it was brought to heel. The first of the two studies involved 894 children from 5 to 17 months old in Kenya and Tanzania. Part of the group was administered a vaccine being developed by GSK and bankrolled in part by the Malaria Vaccine Initiative, under a grant from the Bill & Melinda Gates Foundation. After receiving the shots, all the babies were visited weekly, and their blood was tested for both the malaria parasite and malaria antibodies. On average, the group that received the injections had a 53% lower infection rate than the control group, and the effect lasted for up to eight months. That still leaves 47% unprotected, of course. But this is nonetheless a big jump from the 35% success rate of an earlier formula. "Even a partially effective vaccine could save hundreds of thousands of lives," says Loucq. A persistent worry about any malaria vaccine is how well it will get along with vaccines already administered against other childhood ills. It does no one any good if the new inoculation wrecks the protections offered by existing ones. For that reason, a second study followed 394 Tanzanian infants who were administered a slightly different formulation of the GSK vaccine at 8, 12 and 16 weeks of age, along with routine inoculations against diphtheria, pertussis, tetanus and influenza B. The vaccine not only did not get in the way of those vaccines but also successfully slashed malaria infections by 55% over six months. No one pretends that even with these results malaria is anywhere near beaten. Two more years of testing followed by the bureaucratic labyrinth of the approval process  to say nothing of the logistical headache of actually getting a vaccine to the people who need it  means millions more are still almost certain to die. For that reason the World Health Organization and other groups are stepping up their push to deliver pesticides and mosquito-resistant bed nets across Africa. Those efforts by themselves have rolled back parasite prevalence by 50% in Zambia. Add that to an even imperfect vaccine and you get closer and closer to the moment when today's plague becomes yesterday's memory. 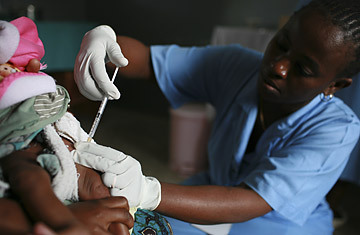 See pictures of the global fight against Malaria. See "The Congo's Hidden Killers."